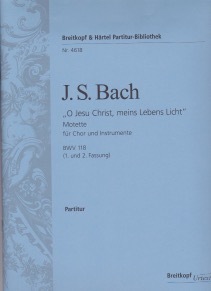 According to the edition’s preface, “O Jesu Christ, meins Lebens Licht” BWV 118 occupies a singular position in the oeuvre of Johann Sebastian Bach from several points of view. It is scored for an ensemble that includes two litui, and it is difficult to classify into a genre; the classifications of motet, cantata, and “Sacred Work for Special Occasions” have all been used. And significant uncertainty surrounds other elements of the composition. For instance, it is unknown why the second version was written; the precise date of composition is unknown; the event for which the piece was written is unknown and the origin of the hymn is unknown. The task of producing an informed and accurate edition requires much research and study. BWV 118 was written in two versions, A and B, each with different scoring. Version A specifies an ensemble composed of two litui, cornetto, and three trombones. Version B specifies an ensemble composed of two litui, two violins, viola, three oboes, bassoon, and continuo. The original scores of both versions are extant, but no parts. The original manuscript of version A is somewhat difficult to decipher due to its hastily written style, several corrections, ink corrosion, as well as holes and tears in the manuscript. Articulation markings are supplied sparingly. The original manuscript of version B is considerably more legible than that of version A, and Bach provided articulation markings (legato slurs) almost consistently throughout the work. Study of these originals informed the present edition. This 2014 edition provides clarifications and updated scoring to reflect current research. Updates include articulation markings from the original version B to inform articulation markings in both versions in this edition; the two litui are scored in the same key as the rest of the ensemble; the voice parts are notated in standard 21st century SATB clefs (treble, treble, treble octave, and bass); a repeat marked at measure 90 as a probable implication of Bach’s original notation in version B and the oboes scored to play the vocal parts rather than the orchestra parts. The trombone parts, scored for alto, tenor, and bass, are active throughout, with little rest. The bass part functions as continuo, while the alto and tenor voices provide counterpoint. The main tessitura of the alto part extends from c1 to c2 and could become taxing, especially if the chorus is repeated to accommodate all fifteen verses. For this reason, the reviewer would like to humbly suggest the notion that J.S. Bach created the rescored second version for predominantly non-wind instruments so that the fifteen repeats could be played successfully. No parts are included, but the score is quite easy to read.